Five reasons why you should be embracing these fresh shades. When it comes to selecting a wall paint, pastels aren’t always top-of-mind. Often reserved for spring decor, the hues belonging to the brightly-colored spectrum are seriously underestimated. So we set out to identify the shades that help dispute all preconceived notions of what a pastel hue can really do—and all the rooms they can shine in. Take a look! We’re swooning over the sweet shade of blue in this beach-side Charleston living room. The softness of the wall paint sets the ideal backdrop for the light rattan accents and sleek white furnishings, contributing to the laid-back aesthetic of the space. While an exclusively pink bathroom may feel too childish, a two-tone scheme that incorporates the hue is a conversely different story. In Sonoma’s Scribe Winery, a delicate pastel pink comes paired with whitewashed wood paneling, setting the backdrop for a medicine cabinet-turned-plant holder. Pastels are much easier to embrace in the kitchen, but in an open layout home, things can certainly get tricky. In lieu of restricting the hue to the confines of one area, don’t be afraid to let it spill out to the adjacent rooms. This light-filled space does just that, by allowing the pastel blue to cover the outer facet of the kitchen island. Dreamy attics and subdued yellows were made for one another. This rather traditional shade fits right in with the contrasting composition of the modern nook. Outfitted with a vintage claw-foot tub, the spot is pure perfection. 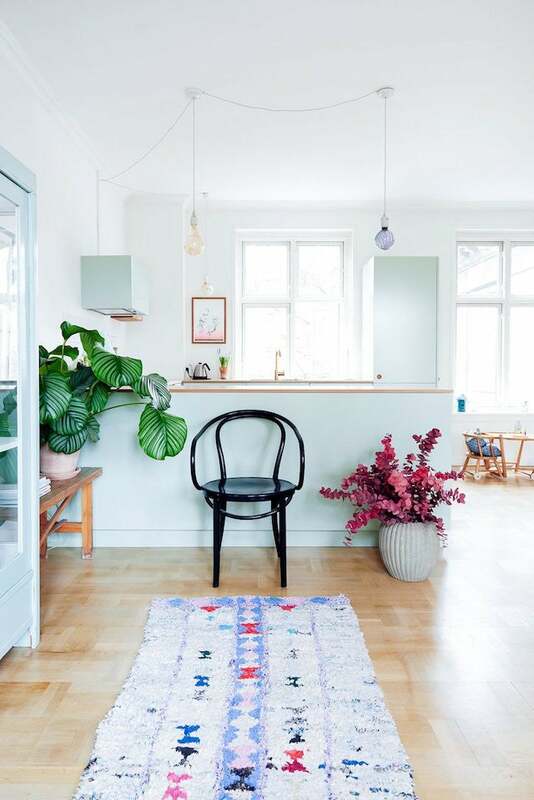 Pastels and Scandinavian interiors hardly ever go hand-in-hand, but this streamlined space is surely making a case for it. We’re loving the refreshing departure from a pastel-hued paint that comes paired with a marble backsplash. Raw wood details and a complementary slew of cream and off-white accents help further elevate the look.